Thanks for considering Miller Brook Cabin. 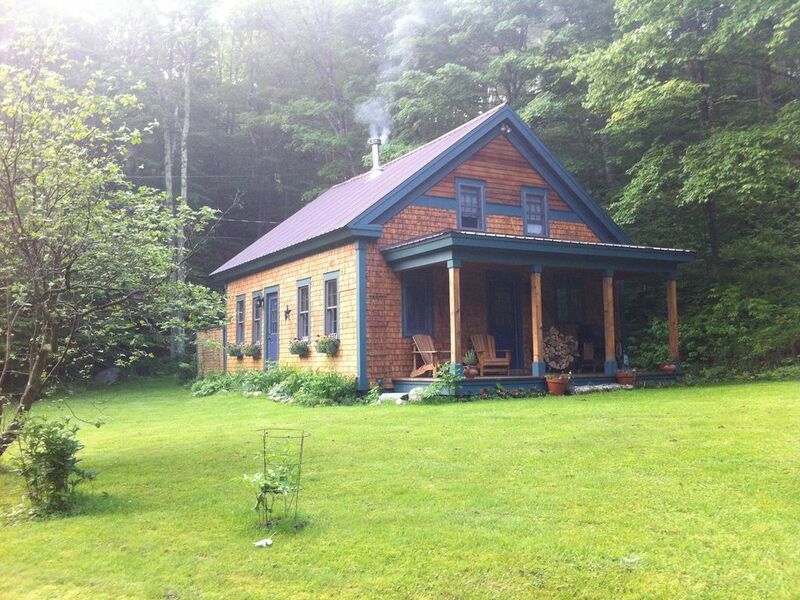 This 1850's post-and-beam cabin is a tiny gem. It's been used for photo shoots and called the most romantic house in Stowe. Wide pine floors, original exposed beams, cathedral ceilings, a wood stove and a hot tub make it a magical place. It has an updated open-plan kitchen, two small bedrooms (each with full sized beds, tucked under the eaves), a living room/dining room and bathroom. I do ask for a bit of information about you so please tell me who you are and if you have kids, their ages. [Also, we are on another rental site that starts with "air" and which has lower rates so please check there as well.] We are avid skiers and use the house so don't accept rentals longer than two weeks in the winter. If you are looking for peace and quiet, can live without TV or cell phone service (don't worry, there is WIFI) then this place is for you. We do have a TV and tons of movies on DVDs, Hulu, Amazon, Netflix, etc. The house is located near the Trapp Family Lodge and 10 minutes from the heart of Stowe and has miles of woods and trails right out the back door. It's set in a stunning valley that dead ends at an historic trout club and lake just a mile up the road. A former editor of a number of national magazines who fled New York for the most peaceful, beautiful valley in Vermont. Bathroom has a shower and toilet, vanity and sink. See Stowe Mountain Resort for skiing details. Stowe is a classic Vermont village with a ski resort and several top rated spas, restaurants and great shopping. This looks out at Miller Brook. There is also a live spring just 20 feet from the house and another brook so you will fall asleep to the gentle sounds of rivers. XC ski out the back door. Snowshoes provided. New, clean hot tub and attached deck. Perfect. That is how I would describe the entire experience. Lisa was the most amazing host imaginable and the cabin was everything we could have asked for. Lisa knew of my plans to propose on this trip and was kind enough to grab some champagne for me. She wouldn't accept money for this and told me it was an engagement present which was really nice and not cheap! We walked in to find not only the champagne but also a lovely assortment of local treats including some cider, a few beers, chocolates, maple syrup, and some snacks. She stocked the frig with some breakfast essentials which was very much appreciated after arriving late in the night. The cabin was decorated with Christmas lights and she had an incredible Christmas tree in the living room. It was really beautiful. The wood stove was really easy to operate and kept us very warm, we chose to use it more than the central heat, but there is central heating. The kitchen was really nice with great appliances. The kitchen had everything you could possibly need and then some which was nice and made living easy. The property is breathtaking. The streams running along the sides of the house were really neat and the brook in the front of the house was incredible. Plenty of time could be spent hiking right around the cabin enjoying the views. The location really could not be better! It is really close to town and everywhere we wanted to go. We booked snowmobile rides and come to find out they start the tour 2 minutes down the mountain so were were snowmobiling in our back yard. It was blast! Dining in the area was impressive. We ate at Michaels on the Hill, Hen of the wood, Solstice, all were incredible. The ski resorts are all really close to the cabin which made visiting them super easy. We spent the last day sledding right behind the house with sleds that she had in the shed. There were also snowshoes available in there. In summary, I really couldn't imagine there being a better host or a better place to stay when enjoying this great part of our country. Many thanks to Lisa and we will definitely be back. I can not say enough about our stay in Vermont. As we drove into the Valley, it was breath taking... snow covered trees that canopied the road were absolutely beautiful. The cabin looked like a post card. Snow covered the roof and grounds, white lights on several trees in the yard.... it was truly a winter wonderland. The cabin had everything you needed, hot tub, snow shoes, wood burning stove, modern kitchen appliances/granite counter tops, washer/dryer, all rooms were comfortably furnished with several antiques pieces and exposed wood ceiling beams that took us back in time. Both bedrooms were upstairs in a loft - which also added to the uniqueness of this cabin. Both beds had down comforters that kept us nice and warm through the night. We have stayed places before where the owners didn't put much thought or creativity into their furnishings/decor and as renters were disappointed. But it is quite obvious that Lisa takes pride in her cabin and wants her guests to feel at home. I actually felt like I was staying at a friends home, not renting from strangers. The location and the cabin itself far EXCEEDED my expectations and we are already planning on returning next year. Trapp Family Lodge was only a few minutes away - we went snow shoeing and cross country skiing there, we had a blast. We also drove to Stowe Ski resort for a day of skiing (~20 min drive from cabin). Check with Lisa before you visit to ask about the road conditions. We rented a 4x4 vehicle and was glad that we did because several cars were having trouble driving up the hills due to the ice on the roads. We had no problems though. The town of Stowe has lots of little shops and restaurants. This is the longest review I have ever written and still don't feel like I have given this cabin/location justice. But then again, I do want there to be availability for my vacation next year - lol. No pets, no parties, no smoking and no extra guests. Also, please no food or drink in the hot tub or on the white couch.